According to historians, early Christianity in England acted like a primitive religion in that it provided quasi-magical ways of engaging supernatural aid through supplication and sacrifice. In this respect it resembled the theurgy of Hermetic magicians. With the Reformation, the magical elements in the Church, and all extra-ecclesiastical magic, were treated with increasing suspicion, though the works of magical theorists like Johannes Reuchlin, Pico della Mirandola, and Marsilio Ficino were still circulating, and John Dee was Queen Elizabeth’s tutor. It is not a new claim that ideas from Hermetic magical texts migrated into the drama of the 1590s and early 1600s. My interest here is in what Johannes Reuchlin refers to in De Verbo Mirifico as the “wonder-working word”: the word used as a powerful magical technology. Reuchlin invokes the Cabbalist’s use of the Tetragrammaton; however, in the Elizabethan theatres there is a fascination with the magical efficacy of all language. In conjunction with the increasing popularity of occult themes and personae, the psychology and also the metaphysics of linguistic influence come under scrutiny. The enterprise of supplementing the human that some Renaissance occultists engaged in figures the word as a mediating force between the divine and material realms, and several playwrights respond, usually critically, but also with ambivalent longing. I want to explore some ways in which the Hermetic tendency to see language as a magical tool, or even a magical entity, manifests in certain Renaissance dramatic works. 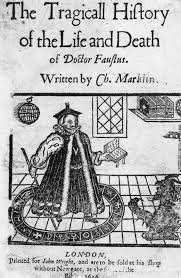 Image source: Frontispiece of the 1619 edition of Christopher Marlowe’s “Doctor Faustus,” printed for John Wright. Reprinted in the Norton Critical Edition, ed. David Scott Kastan (London, 2005).